Weekly Photo Challenge: Juxtaposition – Travel. Garden. Eat. Summer lounge chairs waiting for spring on the snow-covered beach at Lutsen Resort; Minnesota’s distinct seasons, classically juxtaposed. This post was in response to the Daily Post’s Weekly Photo Challenge. ”Juxtaposition” was this week’s theme. Everyone is welcome to join in the Challenge; further details on how to participate and links to others’ responses are found here. I think they’ll be dreaming for awhile this winter! Wow, I am flattered! Thanks so much. We certainly hope so, although I think Spring is a long time coming. Thanks, Louann. While we’ve certainly been up and down the Shore all seasons, we have only stayed at Lutsen during winter! Just love snowshoeing on the Onion River or the Oberg Trail, cross country skiing in the area, and a cozy evening by the fireplace! Great juxtaposition! Love your choice! What a fantastic choice. In light of this weather, this has to be the best. Isn’t this winter something?! Appreciate the compliment, Lucinda! 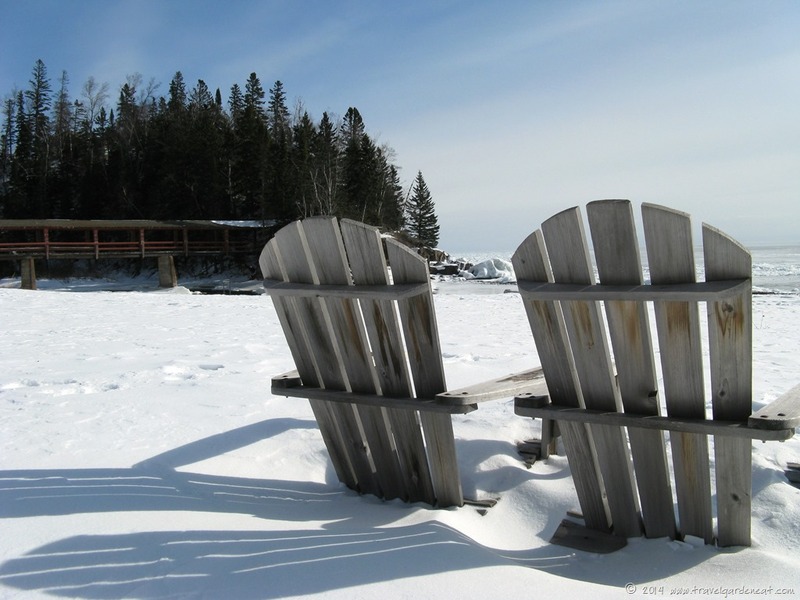 I adore Adirondack chairs, and this is a great photo for juxtaposition – beach chairs in snow. And lovely shadows. I always find it so strange to see a beach covered in snow. Thank you, Jude!! Shadows can add so much to a photo, can’t they? Wonderful capture:) A really great interpretation! Perfect visual to go with it! Thanks, Letizia! Not only do I like this photo–I LOVE it! Great juxtaposition, indeed, Kat. Thank you Kathy! The snow is not so bad but these cold temps really wear on a person after awhile — has been a challenging winter for even the hardiest of souls this year. Hope you are thriving in your wintry corner of the world. I suspect our Spring will be a long time coming this year! Thanks, K ~ have to look on the bright side of the overly long winters sometimes!